When you decide to buy a dog for yourself the most difficult decision is which dog breed to buy. Since there are so many dog breeds out there this is a difficult decision and there are a lot of factors that you have to study to choose the right dog breed for yourself and your family. In this dog breed article we have listed the dog breeds which are considered the best when there are kids around, these 10 breeds of dogs make the best family pets and are good to keep in your house. We hope that this article will help make your decision to choose a dog breed easier. Once you get your pet we have numerous resources on our website to guide you through puppy care, into adulthood, dog diseases, and dog training, we also have a great data base of dog breeds if you are interested. 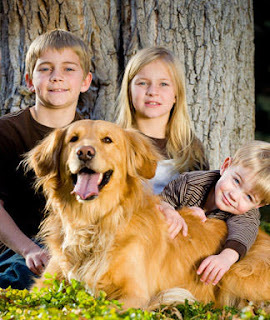 Out of all the dog breeds out there the most popular dog breed to be around kids is the Golden Retriever.This breed is smaller than the Labrador, and is also a smart, kind, loyal and patient dog breed which makes them great companions to be around children. They are full of energy making them good play pets for kids. The reason this dog breed is one of the most popular to be around kids is that it is a very intelligent breed and has a sweet personality. It is patient, protecting, loving and a very playful breed of dogs, and because of these reasons this dog breed is a good match to be around children. The poodles are a dog breed that is very intellegent and gentle at the same time. And although this is a breed which needs some amount of grooming, it is a great dog to be around kids and people with allergies because it sheds very little. The poodle also is very good around children because they are playful pets and are loyal, loving and patient with their owners. The Irish Setter dog breed is a very playful dog that enjoys playing with people and other animals. It would make a good companion for children as the Irish Setter has a lot of energy. They are also a very smart breed that can easily be trained. They are best suited for families and like a large area to play in. The vizsla is quite an unknown breed and you have probably not heard of it but this is the perfect breed of dogs to be around kids. It's gentle and affectionate nature and loyalty to its owners makes it an amazing pet to have. This breed is also known to be quite smart and easy to train and forms a bond with the family members. Known as the "nature's babysitter", the Newfoundland dog breed loves children and will take care of them and protect them with kindness, gentleness and patience. As a family pet what more could you ask for, because of these reasons this dog breed is perfect as a family pet. Due to their large size it is ideal to keep this breed of dogs in large families with large homes because this dog breed prefers to be indoors with the family. The Collie's claim to fame comes from the famous TV show and Movie titled "Lassie" why would it not make an amazing family pet. This breed of dogs is very intelligent and Gentle at the same time. They can be trained easily because of their intelligence and get along really well with children of all ages. Their loyalty to their family is known and they will always protect their owners. They have only one slight drawback and that is their long, silky hair which also makes it a beautiful dog breed, they need to be groomed regularly. The Bull Terriers are bred to be companion dogs, making them great family pets. They are very friendly and lovable animals with a high pain threshold - making them perfect for small kids that may like to tug or pull at them. This breed of dogs is great for larger families as they are full of energy and require a lot of exercise. Remember Charlie Brown's dog, it was a beagle. The reason for this dog breed's popularity is its ruggedness and its energy which make it a perfect pet to be around kids. This dog breed gets along very well with other animals as well and people and thus makes it a very good house pet. One important thing to know about the Beagle is that they shed a lot and thus will require regular grooming, other than that this is also one of the most popular breeds to be around kids. Bull dogs are definitely built strong and tough, which is perfect for rough-playing children. This breed of dogs are friendly and loyal animals but they aren't exactly the most energetic and are considered lazy, which is good for busy families that don't always have the time to walk the dog. They get along great with children and other animals and thus make for good house pets.